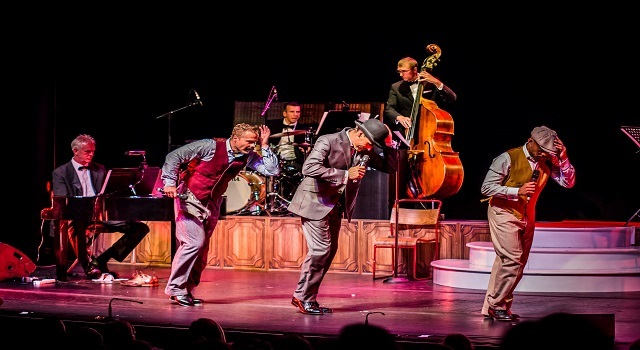 Three of the finest Crooners and the one of the UK’s finest modern Swing Bands in a two-hour spectacular that will have you laughing, singing, dancing and smiling! This rip roaring comedy is chock-full of Big Band Swing and Crooner Classics from the likes of Frank Sinatra, Dean Martin, Sammy Davis Jr, Matt Monro, Tony Bennett and Nat King Cole – with music authentically recreated by the outrageous 9 piece The Mini Big Band fully live on stage. A Brand New laugh out loud comedy for 2017 that bring together three of finest Crooners and the one of the UK’s finest modern Swing Bands in a two-hour spectacular that will have you laughing, singing, dancing and smiling from ear to ear.